I'm participating again in Spoonflower's fabric design contest. This week's theme is "Fifties", with a limited palette of 5 colors representative of fabrics from the fifties. I drew large flowers that I called "Poppies", but maybe you know another flower that would be more appropriate? 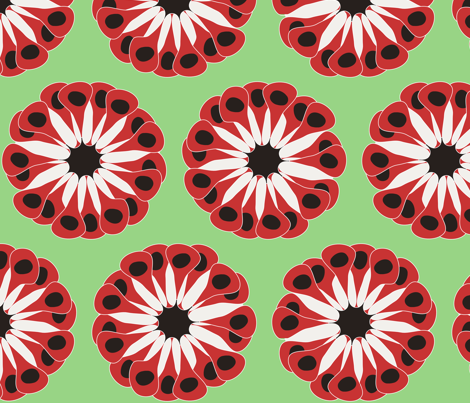 I'm not an expert in flowers and I didn't use a model to design the pattern, I found it by playing a bit randomly with Inkscape, a cool open source vector drawing software. There are 117 designs entered in the contest, many of them very well thought and done. Have a look on the contest page, and if you like my large flowers, please vote for them! To vote: go to the contest page, click on all the designs you would like to vote for, go to the bottom of the last page and click on "Save my votes". Share this coloring page with your friends! If you do not see the online coloring page Spoonflower contest - Fifties in black and white above, you need to use another web browser: see the page Supported Browsers. Here is a printable coloring page if you prefer to color the image with crayons and pencils. You can also click on the image to download a free high resolution digital stamp (digistamp). Do not hesitate to show the result of your coloring. To do this, use the disk-shaped icon, then do "Save As" in your browser to save your colored image in the png format. You can then write a comment and publish your image with the mountain-shaped icon (Insert/Edit an image).